The Pound Sterling may be falling in value and the Royal Navy may no longer rule the waves, but every British pub still has its unique, hand painted sign greeting passers-by. Many tourists are surprised to discover that the signs are still used in the busiest cities as well as in the quietest rural villages. Although modern, internally lit advertising signs are used elsewhere, they don’t appeal to the British pub crawler. 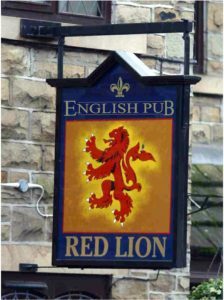 Unlike the US, where many beer brands are sold by all bars, British pubs are often owned by one brewery which sells that brand exclusively. (Those that sell all brews are called ‘Free Houses’ and that’s usually stated on the pub sign.) The breweries have a lot of say about the look and management of the pub. That starts with the sign over the door. Most breweries have staff artists who do all the sign painting. While some are full-time employees of the brewery, most are sign painters whose work is known to the company and who are called upon regularly. Sinnott has streamlined his work methods to let him finish two or three signs a week. He works in an almost assembly line fashion. First, he copies the existing artwork on tracing paper. Then he removes any paint from the board and primes and undercoats the sign. The design is then pounded back onto the board. He applies artists’ oils very thinly for the pictorial and design work. While breweries find it more convenient and usually cheaper to have regular artists, freelancers still survive. Landlords – the pub managers – can request permission to commission a sign if they feel the regular artist can’t meet their needs. One busy freelancer is Pat Murphy. He has a year’s backlog of commissions for both pub signs and other work. A retired art teacher, Murphy looks upon sign painting as less a business than a continuation of British history and tradition. He thinks that’s one reasons the signs are still used. Like Sinnott, Murphy concentrates on large, clear images rather than detailed pictures. Coloring must also stand out from the surrounding background. “A pastoral scene hanging from a large tree in a hedgerow would be lost among the leaves.” He finds that strong colors keep their image longer as well as helping to attract motorists. Most signs in his part of England – the flat, unprotected eastern coast – are made of metal, not wood. While the signs themselves may last longer than wooden ones, the artwork needs just as much protection. In addition to the most fade-resistance oil he can find, Murphy uses “a virtually indestructible varnish” to protect his signs. Both men find that each brewery makes its own demands on design. “One brewery doesn’t put the name of the pub on the sign if the name is obvious,” says Sinnott. Murphy finds that on almost all of his signs, the name of the brewery must be included and must be larger than the name of the pub. Some things can’t be changed.